If you are looking for a quality Smart TV, then go for the Skyworth 32 Inch HD Smart Digital LED TV. The TV is built for internet access in addition to having best picture quality. Skyworth 32 Inch TV is the top selling 32 inch TV in China. There are two versions of the Skyworth 32 inch TV, one is Smart and the other not Smart. 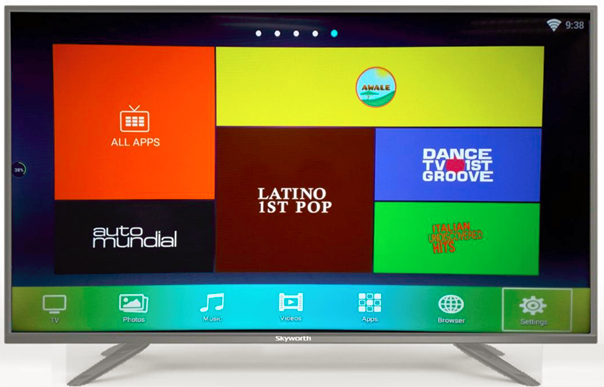 The Skyworth 32 Inch HD Smart Digital LED TV runs on an Android OS, making it on of the best smart TVs to have. It is easy to use as you can simply download apps from the google app store. In addition, you can sync it with your mobile phone. Skyworth 32 Inch TV prices in Kenya are fair. The Skyworth 32 Inch Digital LED TV goes for around KES 16,500 with the Skyworth 32 Inch HD Smart Digital LED TV retailing for KES 21,000. Check Current Price! Skyworth 32 Inch HD Digital LED TV See Price! Skyworth 32 Inch HD Smart Digital LED TV See Price! Connectivity HDMI 1,USB 2,VGA 1,Audio 1,AV input 1,AV output 1. SSkyworth 32 Inch TV is a great TV with high picture quality and better viewing angles than average TVs. It has a high resolution of 1366 X768 HD and can display a wide gamut of colors with gradations. Its motion blur and input lag are significantly low making the TV set a good choice for gamers. It also has IPS screen technology for wider viewing angle. This is attainable because the technology changes the physical characteristics of liquid crystal later by ensuring crystal molecules respond to the electric field equivalent to the TFT technology. This also leads to improved color production. Other screen characteristic technologies include matrix back-light and 10Bit color enhancement. Skyworth 32 Inch Smart LED Android Digital TV comes with 2 HDMI and 2 USB ports that allow you to control and switch between inputs as well as showcase app available on your phone. This Skyworth TV also supports various exterior devices like keyboards, wireless boards, and games via USB and Bluetooth speakers. You can also use your smartphone as a remote control by installing an external application. Skyworth 32E2000-32”- HD LED Digital TV is digital. This means the TV has superior image resolution for a certain bandwidth, great audio quality, and more interactivity. In addition, This television has the energy star label that not only saves you money but also protects the environment. It also has backlight settings that adjust the backlight brightness. The backlight drains a lot of your power and reducing its brightness lowers the power your television consumes. When it comes to audio, the television has 8W audio output and 2.1 channel digital systems. Different sound modes include standard, movie, sports, and user while personal mode types are treble, bass, and balance. Other sound features are tele-text, memory page 1000 and character language. The 32” HD LED digital television in question supports Dolby Digital Surround Sound, a progressive type of digital audio coding that makes storing and transmitting of great digital sound efficient. It also allows conventional stereo outputs. Just like mentioned earlier, the Skyworth 32 Inch LED Digital TV is very affordable and can be found online or at popular local stores that sell electronics. From numerous customer recommendations, it is no doubt that Skyworth 32E2000-32 inch HD LED Digital TV is the best TV set to watch movies and play games. The Skyworth 32 Inch HD Android Smart Digital LED TV enables internet connectivity and comes with browser and streaming apps. One of the most interesting features of Skyworth Smart TV is the inbuilt Chromecast for casting. This means you don’t have to purchase Chromecast HDMI dongle. All you need is to tap the Cast button on your smartphone to start playing on the TV. Some of the apps that come with the TV include Amazon Instant Video, BBC iPlayer, and Netflix. You can download any other app using the Google play store.